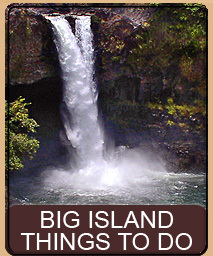 Every year visitors to the island are injured or even die at the active lava flow. The lava flow is a very dangerous place and it is important to know how to enjoy the lava safely. Regardless of how much experience you have with lava, the very nature of liquid rock means that there is always a chance for something to go wrong. Please read this page completely and carefully. DO NOT ATTEMPT TO APPROACH ACTIVE LAVA IF YOU DO NOT FULLY UNDERSTAND THE INFORMATION ON THESE PAGES. 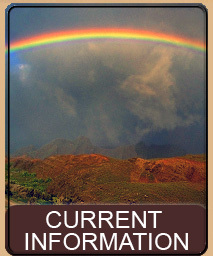 This page contains information vital to your safety at the lava flow. We present the dangers, how to avoid them and what to do if you are in one of these situations. We are NOT volcano professionals - however, we have been to the lava flow hundreds of times and have encountered all the situations we outline here. If you intend to visit the hot lava you should be sure you are well equipped. This section has the MINIMUM equipment that you should bring with you. Feel free to bring anything additional - or extras of any items we recommend here. First - just in general, hiking out to the hot lava usually involves a mile or more of hiking (depending on just where the active lava is). So at a very minimum you will want to bring plenty of water (several bottles), light snacks, a small first-aid kit (in case you fall or get cut on the sharp lava), sunscreen, hat, and sunglasses. There is absolutely no shade or shelter at the lava field, which means you are exposed to the sun, rain, and other harsh conditions. We highly recommend some type of gloves. You MUST wear boots when walking on the active lava field. Sneakers and rubbah slippahs won't do it for you. We do not recommend any boot with a steel shank as the steel can get very hot - and carry residual heat - as you walk around the lava flows. The lava is very hard on shoes so we do not recommend expensive boots. The best boots should come up around the ankle, not have components that are rubber or that might melt or burn easily, and have as thick a sole as possible. Do not pick boots with a smooth sole, which can easily slip on lava, but rather a very thick sole with lots of deep and wide treads to grip the lava well. We do not recommend leather soles as they are easily destroyed by lava. You might consider boots with a stitched sole rather than a glued sole as the heat of the lava can cause the glue to melt and the sole to separate from the boot. Personal Horror Story... On one occasion I had to cross a lava field that was over 800°F. Walking quickly (and carefully) across the field I heard a clang of metal... looked back and saw the steel shank of my boot behind me. Looking at the underside of the boot I could see my sock through a melted hole in the boot - needless to say, that is the last time I wore steel shanked boots. On more than one occasion I had boots, which I had been to the flow with many times with no problems, have both soles drop off due to melting of the glue. Hint: Duct Tape can fix a detached shoe sole. We highly recommend wearing long, heavy denim jeans for your pants. Do NOT wear shorts and make certain any clothing you wear is not easily flammable or can melt (such as polyester or nylon). Even though it is hot at the flow, the long pants will protect your legs from the intense heat and allow you more time to make decisions. 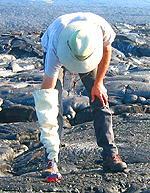 Long pants will also protect your legs from cuts and scrapes as you walk around the cold lava. Just about any type of shirt will work as long as it is not flammable or can melt. Wear what you are comfortable with - keeping in mind that there is no shade or shelter. Gloves, again not of any material that might melt or burst into flame, are highly recommended. The cold lava is sharp and just sitting down and getting up can leave small cuts in your hand. Garden or work gloves are fine (as long as they are NOT made of any meltable or easily flammable material) but if you want to actually play with hot lava you might consider gloves like these which are made from spun glass and Kevlar and can withstand 2000°.F direct contact for 20 seconds before they begin to breech. Gloves can also be life saving should you accidentally fall on hot flow. They will allow you to get back up without additional injury. Personal Horror Story... Once I was skirting the edge of an active flow during a light rain. I stepped up on a rock, slipped and fell on rock that was about 600°F. My left shoulder was directly on the lava and I instantly put the fingertips of both hands on the hot rock and leapt up. Interestingly, the heat of the lava had instantly cauterized the burns and while the pain was very manageable I lost the skin not only on my arm, but all my fingertips. Luckily everything healed with no scars. However, had I been wearing gloves I would have experienced far less injury. Some of the best lava viewing is at night or early morning so it is a requirement that you have flashlights. It is a good idea to bring flashlights even if you do not intend to be out after dark, just in case something happens to delay you. Be sure to bring SEVERAL SETS of backup batteries and we recommend 2 flashlights per person in your party so that you have extras should you have equipment failure. A walking stick is VERY useful at the flow. We do NOT recommend metal walking sticks as they can overheat and melt. The best walking stick is merely a guava branch (you can find guava growing along the highway between Mountain View and Volcano Village - very straight short trees that are very easy to grab a branch from). Use the stick to help you up and over tumulus and hills as well as to thump the ground to see if you are over a hollow tube. 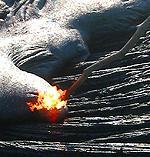 Wooden sticks can also be fun at the active flow to poke into the lava. A pyrometer and night-vision goggles are useful, but not required. A pyrometer is a small handheld device that will tell you the temperature of anything you point it at. These devices can make it easier to walk on hot ground as they can provide you a means for finding the coolest path. Night-vision goggles are useful if you are trying to find lava at night as they can easily pick up the hottest areas. While these devices are useful, nothing is more useful than proper knowledge and understanding (it is never good to rely on electrical components to ensure your safety). You would think that this would be a no-brainer... I mean, really, instructions on how to walk on solid ground? But walking on cold lava is not as simple as it looks, and in order to find the hot lava you will have to walk on at least a mile of cold lava. RULE #1 WHEN WALKING ON COLD LAVA - If you are interested in looking at something STOP WALKING... look... and then before you start walking, look around you to make sure of your footing. Too often when being distracted at some interesting sight, people trip over the rough lava and take a nasty fall. Ropey pahoehoe lava requires special attention to walk across. In general it is best to walk perpendicular to the ropes and on top of the ropes. That way you avoid getting your foot wedged between the ropes and your footing will be much firmer. 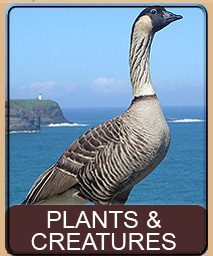 Be careful though because ropey pahoehoe can easily crumble. When you walk the cold lava fields you will see that there are many cracks and fissures in the ground. Some cracks are caused by heating and cooling effects, while others are caused by pressure from lava moving under the ground or by earthquakes that have split the lava. Whatever the cause, a fissure can be anywhere from a few inches deep to practically any depth (we've certainly seen fissures over 40 to 50 feet deep). The edge of a fissure can crumble so it is best to examine a fissure and figure out the safest way over it. The cold lava field has many small hills called tumulus. These are areas under which a lava tube runs and the pressure of the lava caused the rock to bulge upwards. Most tumulus are fine to climb over - and offer you a good view of the surrounding area - but you should be careful of the fissures that almost all tumulus have. As stated above, when stopping to look at something always look around you before starting walk again. Too often I have stopped to examine something, taken a slight step backward forgetting there was a fissure behind me and scrapped myself pretty severely. Try to avoid any area where the ground sounds hollow under you. If you brought a hiking stick, use it to thump the ground. A hollow area indicates a lava tube is under you and there is an increased chance that you could accidentally break through into the tube. Tubes can be anywhere from a few inches deep to 40 or 50 feet deep - so accidentally breaking through a tube can be a life threatening situation. The danger of lava tubes changes depending on where in the lava field you are (more on this below). One of the odd things about human nature and the lava field is how people react to seeing the lava. 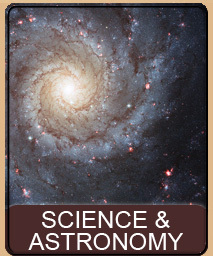 Most people are awestruck, some are scared and almost all misjudge the danger factor. In fact, it seems that people have little to no fear in the most dangerous areas, and lots of fear in some of the safer areas. Ocean entry is one of the most dangerous places to view lava. Ocean entry is what happens when the 2000°F liquid rock reaches the ocean and hits the water. The dangers here are outstanding, yet this is the spot where the most tourists gather and the most accidents happen. The largest danger is a collapse of a lava bench. As lava flows it tends to build the land upwards more so than outwards. Lava flows on top of lava flows can easily build the land upwards 50 to 100 feet as it flows towards the ocean. However, at the ocean the lava goes over the cliff, enters the water and fragments and creates a sandy beach which then has more lava build up on it. When people go to see the spectacular ocean entry they line the cliff side to view the lava and several acres of new land below them - often only a day or two old. It is irresistible to some people to jump or climb down to this new land and explore it. Often they wish to get the best angle for photos, or just go check out a brand new black sand beach that is only hours old. The danger of the lava bench is that it is on unstable, brand new ground. The ocean waves are undermining the bench while at the same time active lava on top and within the new ground are eating holes and creating cracks. Almost all benches collapse within a few hours to days of being formed. As you might imagine, a collapsing lava bench is a spectacular sight - with acres of brand new ground breaking up in seconds and disappearing into the ocean, usually with thunderous explosions as huge quantities of molten lava vaporizes ocean water. You can imagine what would happen to anyone down on the bench, or even people on the cliff side where it might crumble in the ensuing earthquake. I have personally seen the lava bench collapse twice - both times spectacular and I was very happy that I was not on it. Other dangers also exist for these brand new black sand beaches. The sand on these beaches is created by the lava hitting the ocean water and fragmenting and the waves bring the resulting sand up to the new beach. As you can imagine, lava entering the ocean makes the surrounding water very hot. Often a seemingly safe beach will suddenly be hit with a large very hot wave that can not only carry people out to sea, but also burn them with the super heated water. Since the beach is below the cliff, often time there is no place to escape the rogue wave and not enough time to climb to safety. When lava hits water one of two things happen, either it combines with the water creating steam and lava particles that create the beaches, or if enough water hits enough lava the result is an explosion. Explosions of lava at the ocean often cause red-hot lava globs as well as colder rock to be hurled 50 to 100 feet into the air, back onto the land. It is quite an experience to be sitting, watching a spectacular lava flow enter the ocean - and suddenly have molten lava flying in the air and landing behind you. Needless to say, you should get out of the area very quickly. One final danger at the ocean entry is sulfuric acid. While the fumes from the lava are dangerous if too much is inhaled, it is especially dangerous at the ocean where the combination of water and lava produce corrosive and dangerous gasses including sulfuric acid. Avoid breathing the vapors and do not be in this area if you have any breathing problems. To enjoy the ocean entry you simply must always be completely aware. Pick older lava to watch from, as opposed to newer lava. Examine the area you are sitting to see if any large cracks are in the cliff-side that may break off into the ocean during a bench collapse or earthquake. Avoid leaning over the edge of the cliff (the park recommends you stay at least 50 yards behind the cliff edge - but many people ignore this to get the best photographs). Under no conditions should you go down onto any new bench, regardless of how many other fools (like us) you see doing it. As we stated above, people view perceived dangers completely differently from the reality of the danger. Just as people will flock to the highly dangerous ocean edge and think nothing of it... when we take people back on to the flats to see surface breakouts many freak out. The facts are, however, that the flat, two to three mile expanse, between the ocean and the pali (hill) at the back are one of the safest, and most fun places to view lava (safe, here, is of course relative - everything is dangerous, this is just the least dangerous). While ocean entry is nice - and very photographic, nothing is more fun or gets you closer to the liquid rock than a surface breakout. Normally lava runs underground in lava tubes that come out of the cliff side at the ocean. However, often the tubes will be obstructed by rock that will halt the forward progress of the lava. The blocked tube causes the lava to build up pressure behind the blockage, which makes the lava find alternate routes, many of which lead to the surface. Where the lava breaks through the surface you have a surface flow, with the lava pouring and pooling on the ground. Since there is no water (except possibly rain) on the flats, and this is old land (so a massive collapse of the land is highly unlikely) most of the dangers of the ocean entry are not found here. One thing that seems to mess with people's heads is that as you approach surface flows often times you step up on rock which has had recent lava flowing under it (recent, as in several days ago). While this rock is absolutely fine to stand on, people note that it is hotter than the rock they were just on - and this causes fear. If it is evening you can also see that many of the cracks in the ground are glowing red - this can be alarming but is actually harmless as this is just the cooling of the rock much farther down. If you can stand still on the rock for 60 seconds or longer without discomfort than there is little to worry about as far as the heat or glowing cracks are concerned. The dangers on the flats tend to be more of keeping aware where the surface flows are. You can become easily absorbed in a beautiful flow in front of you, to miss the fact that another surface flow has broken out behind you and is beginning to surround you. It would be most inconvenient to be trapped in the middle of an active flow - so keep aware. Fumes are always a danger regardless of where you are. As with the ocean entry, fumes on the surface flow can also be health threatening. To enjoy a surface flow you will prefer to be upwind of the flow - that keeps the fumes blowing away from you and also makes it cooler since the wind is blowing the majority of the heat away from you. Being downwind of a surface flow is always a much hotter place to be. There is also the danger of falling into a surface flow. People try to get as close as possible for good photographs and it is easy, when you have a camera to your eye and move slightly for that perfect shot, to trip and fall. Falling into the lava will be an experience you will never forget. On the good side, the injury is cauterized instantly from the tremendous heat; on the bad side is the additional damage you will do to yourself trying to get out of the lava. So be very careful the closer you are to the lava and watch your step. Hasty movements usually end up in injury. 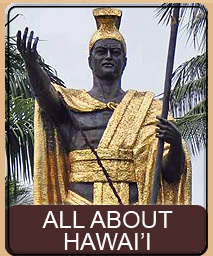 The Hawaiian word pali (pa-lee) means hill or cliff. 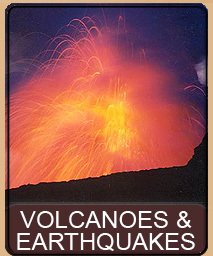 The active Pu'u 'O'o vent sits about 7 miles behind the ocean, at an altitude of about 3,000 feet above sea level. The lava flows towards the ocean and about 2 to 3 miles before the ocean descends a steep, 1,200 foot cliff and then out onto the relatively safe flats on it's way towards the ocean entry. Most people stay away from the pali because it is a couple mile hike. However, in times where the lava is not on the flats or ocean, but is pouring down the pali, it can attract people to hike back to the cliff and watch the spectacular lava cascade down the steep hillside. Of course, some people don't want to stay on the flats below the pali, but instead want to climb up on the pali to get as close to the lava as possible - this is where the danger lurks as the pali is incredibly dangerous to climb. When lava flows underground, in lava tubes, on relatively flat surface such as above the pali or on the flats - the tubes tend to be fairly large and usually are fairly deep (in relative terms). However, when lava flows down the steep pali it moves much faster and the tubes are thinner and much closer to the surface. There are two primary dangers to the pali - the first is breaking through into an active or inactive lava tube - which can result in bad injuries or even death. The second is getting trapped by flows on the surface of the pali that give you no way to get out or around. Personal Horror Story... I have climbed the pali three times - and each time it was a nerve racking experience and my fear level was off the charts. On two occasions I broke through lava tubes - one very small, only a foot deep and the other about 4 feet deep. Luckily both times the tubes were old and my long pants saved me from injury. Basically, safety on the pali requires that you ALWAY hike with one or more other people in the party, and move carefully up the side of the hill using your hiking sticks to probe for hollow tubes and watching the surface flow patterns always keeping in mind how you would escape back down in an emergency. As lava runs through lava tubes in the ground they usually fill up the tube about 3/4 of the way. However, during a surge of lava, the lava may fill the entire tube and exert pressure on the roof of the tube. The roof of any lava tube is, of course, the ground you walk on - and the pressure can crack the roof and cause portions of the roof to cave in (earthquakes can also cause lava tube roofs to crumble). A skylight is any place in a lava tube where the roof has caved in and you can peer into the tube. There is an excellent example of a skylight on the way to the flow in our Lava Tube Tumulus and Skylights Climb hike. Skylights are wonderful things - especially if the lava tube is active and filled with lava. However, there are dangers associated with skylights. First, on the cold lava ground you will often encounter skylights as you are hiking. Obviously you would not want to fall into a skylight because you could end up with serious injuries, and if the tube is deep enough there may be no easy way out. If the lava tube was active you would CERTAINLY not want to fall in, as you would be very dead very quickly. However, that aside, an active skylight is a beautiful thing. 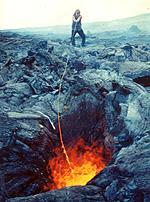 You can peer in and see the lava moving, often 30 to 50 miles per hour as a river in the tube. We have peered into skylights and seen waterfalls (lavafalls?) of lava in the tube - a spectacular sight. To view a skylight with safety in mind - remember that the edge of the skylight is almost certainly crumbling. The closer you stand to the edge, the more chance you take in making the skylight larger and adding your mass to the molten lava. Also keep in mind that this is in a lava tube. You will need to quickly ascertain where the lava tube is running so you can stand more to the side rather than directly over the tube. This can often be harder than it seems and on more than one occasion we thought we were safe only to find out later that the lava tube branched and was actually directly below us. Because you are viewing magma, lava underground, the opening in the tube releases a great deal of heat. The temperature of the air forced out of the lava tube is orders of magnitude higher than anything you will experience simply viewing lava on the flats. You will certainly want to be upwind of the heat plume of a skylight and in situations where I have been downwind it is nearly impossible to breath. Say what? Crossing Hot Lava? Well yes... there are several times you may need to cross hot lava. First, you may need to escape an area where you are being surrounded by lava. Second, you might want to get upwind of a flow. And third, you might want to get to that absolutely perfect photo opportunity. Whatever the reason for crossing a live lava flow - it pays to know how to do it as safely as possible (and there is a fourth reason - that is to save someone else who is trapped - as happened once when we needed to rescue a small terrified child standing on a very hot flow). First, let's define hot lava for the issue of crossing it. 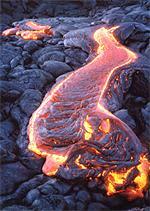 We don't mean RED HOT FLOWING LAVA - you cannot walk through flowing lava - period. We mean lava that is flowing under a thin crust of rock. This is still terribly hot lava and you can easily die by making a mistake. As lava flows it forms a crust on the surface. Under that crust the lava is still flowing and thus still heating the crust. Once a crust forms on lava and there is no more surface movement of lava, the crust can support your weight after about 10 minutes of cooling. Only an inch of crust can easily support an adult person so falling through the crust, unless you wander onto lava younger than 10 minutes old, is unlikely. To cross a hot lava field we want to first scout for the area where we will have to cross the least distance. Since you will be accumulating heat through your feet and legs as you move, the longer you are on the hot lava the less you will be able to stand the heat. So look for an area where you cross no more than 40 to 50 feet of flow before finding older cooler lava to rest and cool off. Once you have located a place you think you can cross look over the area to see if there is any indication of red flowing lava. Especially try to see where you will leave the lava on the opposite side - as this is the hardest to judge. Often there will be a lip of molten lava you can't see at the edge which will require to re-map your route while crossing. One thing you need to keep in mind when you cross lava is that you should NEVER hurry. You want to walk slowly and carefully across - do not run! Running can cause you to panic and misjudge and not give you enough time to properly observe where you are going. Also, the heat of the lava can build a liquid layer between your boot and the surface and running can cause you to slip and fall and you certainly don't want to fall while crossing. So you want to walk slowly, and deliberately, keeping an eye at all times on your path as well as any obstacles you might encounter. Now here is the rule for determining how hot lava is. We have used pyrometers (devices that can measure the temperature of whatever it is pointed out) many times to cross fields, until we learned how to make the same judgment without the pyrometers. For the most part, the hottest temperature you can cross safely (assuming proper boots and denim long pants) is about 800°F to 850°F. Above that temperature your body will instantly tell you that it is too hot (this is one reason lava is fairly safe - your body will keep you away from anything too hot). In general, 850°F is probably the highest I have ever crossed, and when I got to the other side I said wow, that was too hot. Most of the crossings we make are in the 600 to 700°F range. At 600°F your boots will get very hot, and may smell a bit, but will not smoke. Above 700°F your boots will smoke when they hit the lava and will often leave a slight outline of the sole where you step (this is caused by water vapor between your boot and the lava). Anything hotter and your feet simply won't let you go. So to cross... find the spot to cross, step deliberately and slowly up onto the cooling flow and cross in a measured and slow pace until you get to the other side. As you approach the other side be especially careful to note if there are any liquid flows present at the exit point, and map yourself around till you are safely across. You will require 5 to 10 minutes for your boots to cool before you attempt to cross any other lava in this manner. As if there were not enough dangers at the lava field, we need to mention steam explosions. We already discussed explosions at the ocean entry, but steam explosions can happen anywhere, including the flats and pali. Steam explosions can result after a sudden brief rainstorm. Often while hiking the lava field you might encounter a small rainstorm. This is generally no big deal and the wind and heat from the lava quickly dry you off. However, if enough water accumulates in the ground it can be super heated by the lava and suddenly explode in a huge release of steam. Often this release of steam will bring rocks with it - causing an aerial assault. Less likely, but still possible is the steam actually venting where you are standing, in which case you would be broiled alive (which happened to an unfortunate person a few years ago). Another danger from a sudden rainfall and steam occurs at night. Enough steam can obscure your vision and suddenly make you uncertain which way you are going. It is easy to be lost at night when all around you is steam. It would be unfortunate to get turned around and fall off the cliff at the ocean or into a skylight. If this situation occurs the best solution is to climb any nearby tumulus to gain altitude above the steam until you get your bearings. Methane explosions are the final danger we will deal with. These are fairly rare for the majority of the places you will visit. However, if the lava is coming down the pali through forested areas, or is on the flats near any brush, methane explosions are very likely. Often you will be hiking and hear a deep boom and see a huge flame - indications of a methane explosion. As lava moves through forest or brush, the heat can decompose the roots and underlying organic material and cause methane to form. The methane can, of course, be ignited by the lava itself causing an explosion. The explosion usually tears up the ground and sends trees and rock flying in all directions. The solution to avoiding methane explosions is very simple - do NOT under any circumstances enter a brushy or forested area where lava is flowing. Skirt any such area and avoid approaching any burning or smoking organic material. The bottom line to keeping safe at the lava field and having a good, enjoyable time, is to be well-equipped, well-prepared, and DO NOT AT ANY TIME PANIC. Panic causes irrational thinking, which directly leads to injury or death. Keep the above points in mind... stay aware of your surrounding... know what to do if an issue arrives... keep calm and move slowly and deliberately. And enjoy the lava! This page is named 'Volcano.warn'. Can't Find It?